Richer, sweeter and creamier than the more fragrant Thai red or green curries. 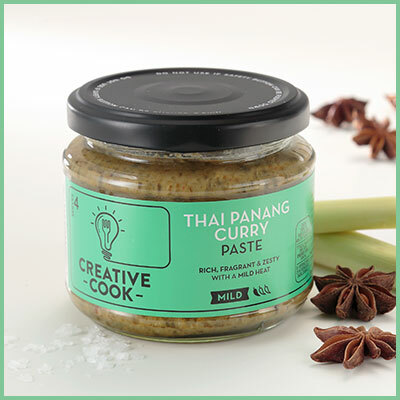 Packed with sweet coconut and fragrant ginger and lemongrass, our Thai Panang Paste helps you create a delicious flavoursome curry in minutes. To Garnish – freshly chopped coriander, roasted peanuts and finely sliced red chilli. To start, pour the coconut milk into a pan, gently bring to the boil and then simmer for 5 mins. Add the Panang Curry Paste and mix thoroughly. Next, pop in your chicken and gently bring to the boil, reduce the heat and lightly poach the chicken for 5 mins. Drop in your red pepper and simmer for 2-3 mins. Pour in the cream and simmer for a further 1-2 mins until the chicken is cooked. To serve – garnish with a sprinkling of freshly chopped coriander, finely sliced red chilli and chopped roasted peanuts, alongside a steaming helping of aromatic jasmine rice. Simply divine. Using beef fillet instead of chicken breasts and serve with noodles and stir-fried greens. Substituting the meat for a combination of vegetables; such as squash, carrots, cauliflower and peppers together with cubes of tofu.